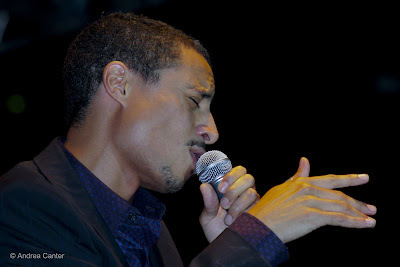 Expectations were high when José James was the lead vocalist for the Minneapolis South High School’s Pop Singers in the mid 1990s. And as a teen, he gigged with the great Carei Thomas before heading to Manhattan’s New School. He returned for a while and gigged at Fireside Pizza, only to become a finalist in the Thelonious Monk International Vocal Competition in 2004. Now based in London, James has three acclaimed recordings to his credit and another in the can, a feature in the May issue of Jazz Times, and blatant suggestions that he is on the brink of super-stardom. While critics scratch their heads as to how to label his wide-ranging talent, José returns to the Twin Cities with pianist Jef Neve in support of their duet release, For All We Know (Impulse), to be celebrated at the Dakota tomorrow night (June 24th). José notes early inspiration from Nat King Cole, and perhaps had Cole worked into the 21st century, this is where he would have taken his music. What we hear now on For All We Know are the influences of Elling, Murphy, Willliams, Lucien, and Hartman; and, at least coincidentally if not intentionally, across the gender divide, Shirley Horn, Betty Carter, Cassandra Wilson, even Norma Winstone. That’s heady company for a 31-year-old, but José warrants the comparison. For All We Know includes nine standards from jazz and popular repertoire which James and Neve recorded themselves as an “artists’ record” without considering its appeal, that it might be picked up by a label like Impulse (issuing its first new recording since Alice Coltrane's Translinear Light in 2004). That appeal lies in the selection of timeless tunes with new interpretative twists, as if each song was written in this century, and sung as would only one with an affinity for both Coltrane and Cole. And Jef Neve isn’t merely an accompanist, but rather offers his own abstract counterpoint, which only works when a singer has unflappable pitch control and when the two musicians—as two poets-- think with one mind. The result is not only the most technically and artistically brilliant vocal album I’ve heard from his generation—male or female—but most definitely the most unpretentiously seductive. We can be seduced at the Dakota tomorrow night, and are promised a preview during Debbie Duncan’s gig there tonight. Who knows, we might be subject to the most unpretentiously seductive duet in Dakota history. CD review to be posted this week on JazzINK and Jazz Police.